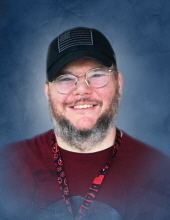 Tommy Robert Allen, 42, of London, KY, passed away Tuesday, April 9th, at the St. Joseph London Hospital. Tommy was born in Manchester, KY on December 31, 1976, a son of Shirley (Cotton) and Sherman Allen, Jr.
Tommy is survived by his parents, Shirley and Sherman Allen, Jr.; by his three sons: Hayden Allen, Dylan Allen and Carson Wynn; and by his fiancée, Miranda York, all of London. Tommy is also survived by his sister, Tabitha Peters, of London; and by his two nieces and nephew: Graci and Lilli Gilbert and Eli Peters. Services will be held at 2:00 PM on Friday, April 12th at Britton Funeral Home in Manchester, KY, with Ronnie Brown officiating. Burial will follow at the Manchester Memorial Gardens. Visitation will be held 11:00 AM on Friday, April 12th at Britton Funeral Home in Manchester, KY.
To send flowers or a remembrance gift to the family of Tommy Robert Allen, please visit our Tribute Store. "Email Address" would like to share the life celebration of Tommy Robert Allen. Click on the "link" to go to share a favorite memory or leave a condolence message for the family.